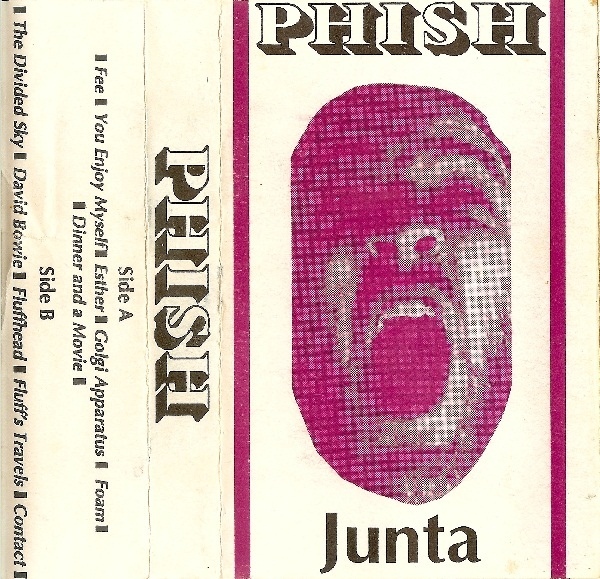 The original Junta cassette cover with Fishman’s face as released in May 1989. There’s no doubt Phish will go down in history for their live shows. That’s where the magic happens and most of the noteworthy things the band has done. The picture is not complete, however, without including the studio albums. There are some great moments found there as well and are pretty clear snapshots of the musical progress of the band. Not counting “The White Tape” as that feels mostly like demos and song snippets, the studio journey begins at Junta. Recorded throughout late 1988, it’s amazing that the studio takes are almost more complete and detailed than their live counterparts at the time. For a good comparison, listen to 12/10/88 and then play Junta and the difference is almost night and day but they were working on the album about the same time they played that show. The other thing that’s startling about Junta is that the band produced the album by themselves. Yes, they had a lot of help from studio engineer Gordon Hookailo to get the feeling right. It’s amazing that this polished a work is not only the band’s first studio album but self-produced. That takes a lot of hutzpah. No doubt a lot of the recording was live to tape but there are some overdubs and studio tricks. 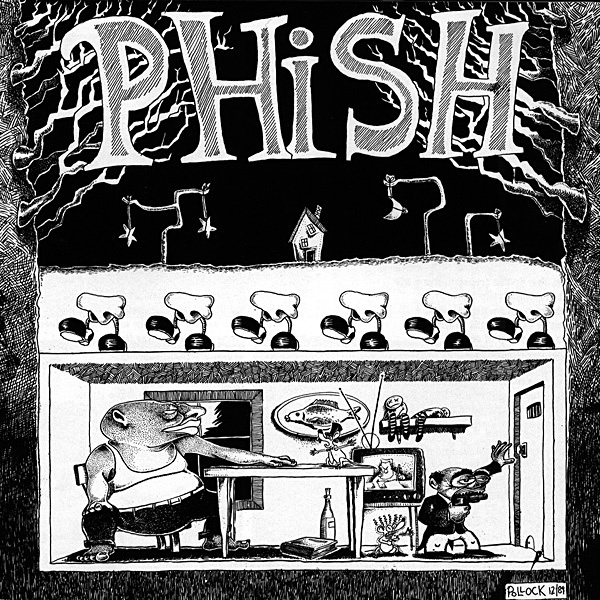 I wish there was more documentation about the recording of Junta but neither Phish: The Biography, The Phishing Manual, Phish.com or Phish.net cover it in much detail. The album leads off with “Fee”. The thumping kick drum of Fishman was probably many people’s introduction to Phish after being advised to start with this album in the days before A Live One. A fun note about the recording process is the effect on Trey’s voice was accomplished by running Trey’s vocals through a pair of headphones into another microphone. Trey, of course, would attempt to recreate this effect on tour by singing his vocals into a megaphone. The layers on the studio version are insane. You have the triangle and the guiro on top of Fish’s regular drumbeat. You have the repeating “Fee” harmony line. You have all the added sound effects. The unique instrumentation should grab any listener but add-in that this is the first true studio track from the band and it’s mind-blowing. Then, the band doesn’t pull any punches and takes it one step higher with “You Enjoy Myself”, considered by the band themselves as THE SONG. The studio version though leaves a little to be desired though. It’s well-layed and mixed but when compared to live versions, feels like they held a little bit back. But a huge difference from the same era’s live versions is everything feels so even, no rushing the tempo for pushing volume. It really hits the 4-man unit feeling throughout even as Trey solos over the top. The “Wash Uffizi” section hits a real groove that also hasn’t translated live yet. It’s just much smoother. I also like that it has a truncated section that keeps the vocal jam feeling instead of some fabricated finish that other bands might have done in the studio. “Esther” is probably best heard here than an actual live version. With how rough early versions were in late ’88, it’s quite amazing that the studio version came together so nicely. The backing harmonies are just right. Trey and Page weave delicately around each other in the middle “adrift” section. Trey said that just about the time that Phish was starting up the Junta sessions, the band kind of abandoned Gamehendge but it would have been nice to see this bookended with “McGrupp and the Watchful Hosemasters” on this album since the two are very similar. Trey hits an amazing tone on the gorgeous outro solo to close the recording. No live version has really touched this one since, which is amazing because it doesn’t sound like it has many overdubs. “Golgi Apparatus”, of course, was probably the first “Phish” song ever written with its lyrics coming from Trey and Tom Marshall’s junior high biology class. The bridge solo would most likely come later though. Not much difference here between live versions and the studio version. Just as energetic and tight. “Foam” is a beast of a song. The fact the band was able to polish it enough for recording and then able to harness all of it on tape is amazing. Mike’s bass hits hard and sharp, setting the tone and helps remain a driving force through the song. Page’s keys and Trey’s guitar trade off leads as it depends towards the verse. The fact that each of the 4 lines is so clearly heard,e even on lower fidelity recordings is astonishing and hats of to engineer Hookailo on that one. You can almost pick a line and listen to it for the entire 7-minute track, even more so on the 192 kHz digital release. Mike also backs off nicely when Page and Trey take their respective solos in the last 2 minutes. The ending descent and buildup is also masterfully recorded as the madness isn’t lost. “Dinner and a Movie” is a curious inclusion as it’s very short but it’s odd rhythm structure does showcase the band’s ability to get quirky and play fast. The main thing I’d love to know is what the recording is that’s played under the band. It sounds like random sound effects, much a little Beatles recording but knowing Phish it might be themselves played backwards. Nothing has been noted of what was going on during this session either. Inquiring minds want to know. But it’s a fun song to end side one of the original cassette order. The later more well-known cover of Junta as designed by Jim Pollock. This cover would be finished in December 1989, 7 months after the initial release. Side two kicks off with Junta’s indubitable centerpiece “Divided Sky”. Captured here in all of its perfectly written glory, this is a masterwork of both Trey Anastasio’s composition and Gordon Hookailo’s engineering. The song, of course, is perfect in its tension and interlocking parts. The 4 move effortlessly through the complicated piece. Adding to that is how perfectly all 4 parts are captured. One doesn’t overpower the other. Even when Trey clearly has the lead, the other 3 parts aren’t merely pushed to the side or turned down to be filler. Each part takes as much equally. Such as the “Christmas Star” middle section, Page’s organ fill rises and falls along with Trey’s lead guitar part and then when Page’s swirling organ drops out, Mike’s complimentary bass line takes its place and moves the piece along just as much, all the while Fishman’s drum part keeps things humming along. It almost feels like Hookailo rotated the other parts’ levels behind Trey to keep you interested on everything at once. Then, it switches to the “Gus” outro” and the 3 parts become almost one, driving everything while Trey plays his fugue lead. It never gets muddy though. While the 3 parts sound together, you can clearly hear them separately and discern who’s doing what. At the end, the 3 rise to Trey’s part and they almost become a whole unit again with each one countering the other, even though Trey’s part remains the lead. The fact that the recording captures this dynamic without making things muddy, again, is a real engineering feat. It’s enough to wish there were isolated tracks, so you could go in and out of each part by itself and it’d be very dramatic. Fish’s drum part alone would be a wonderful story to hear. Clearly a lot of effort went into this song and rightfully so. For the complete opposite, one only needs to skip ahead one track to “David Bowie”. Even though it’s highly composed, it’s very cacophonous. The band almost doesn’t sound linked up and like the rest of the band’s just trying to remain with Trey as he swoops and dives through parts. It’s nowhere near as polished as “Divided Sky”. You can almost hear the collective sigh as it drops into the jam segment. Also, all the parts sound real muddy hear especially the rhythm section. The lone real jam on the album, Trey and Page almost take it easy with light riffs between each other. There’s also again, very weird sound effects throughout the jam as well, adding to the madness. It’s almost too much. The jam would have been enough without the weird sounds. Again, there’s no record as to why they exist or who thought of this. They also seem like an afterthought and aren’t set at the right levels. The sound effects are usually too loud for what’s going on. I know the band had played with sound effects on “The White Tape” but there’s really no benefit here and I’d love to hear the explanation for this one. The Bowie jam is also pretty typical of the jams at the time, maybe a little slower than the live ones. “Fluffhead” and it’s counterpart “Fluff’s Travels” are another long suite played to perfection. I think one of the most interesting things about the studio version of “Fluffhead” is Trey is on acoustic guitar for most of the song and then right as it goes from “The Chase” to “Who Do? We Do!” there’s a switch to electric that you don’t even notice until the tone changes. The acoustic also matches Page’s piano really well during their paired parts. Not much room for variation here but it’s certainly tighter than comparable live versions from the same era. Also, there’s less of a release when they build in “Bundle of Joy” and release in “Arrival” on the Fluffhead refrain than live versions. Would have been nice to have some dynamics there to emphasize how big it is when the band arrives in unison to the Fluffhead refrain. It’s a nice switchback that the song ends with Trey on acoustic again, bringing it full circle. “Contact” ends the album perfectly. I’ve always been a fan of this song since my first show, so I’m definitely biased to it but it really does send out a nice message. Mike’s bass intro is so warm and fuzzy, it’s really inviting. Each member kind of has their own intro into the song, which almost feels like a coda of introductions, reminding you once again of the 4 parts that make up Phish. I also like that Phish really gives the song that “lounge singer” treatment that it deserves on record. I also like that since it’s Mike’s song, the bass is at the forefront of the song and leads the way, not forced to take a backseat in the car. Also, during live shows, Phish would try to get everyone to sing along and the use of the children’s chorus for that effect is a nice touch. Video of them recording the kids can be seen at the 4:21 mark in the 20th anniversary montage video below. The CD re-release in 1991 by Elektra Records would add two live tracks from 7/25/88, “Sanity” and “Icculus”, and a home recording of an Oh Kee Pa ceremony entitled “Union Federal”. Since those were not on the original album and the 2012 re-release, they are not included here. Junta remains the gold standard of Phish studio records so far. Their subsequent efforts came close. It’s odd that Phish would never self-produce an album again nor work with Gordon Hookailo either. Maybe that’s a good thing as well since it’s hard to capture lightning in a bottle once let alone twice. Trey moved on from long, composed pieces, besides for a handful, as well but he did the right thing in getting them all down on tape early on, rather than waiting for the next go round or a major record deal. This is Phish at their most refined and raw. An odd paradox that makes for a classic album. Note: This review used the HDTracks 24/192 FLAC as reference.